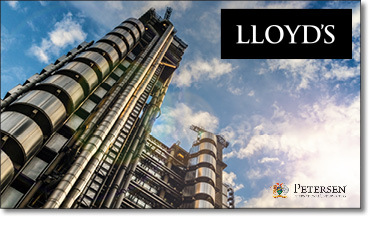 As a premier Coverholder for Lloyd’s of London, Petersen International Underwriters has been allowed the distinction and privilege to be a part of the historic Lloyd’s market for almost 40 years. Lloyd’s is a highly-rated, celebrated and storied organization that organically came to being around 1688 in the London coffeehouse of purveyor Edward Lloyd. His establishment became a recognized center of financial influence in the city where merchants, entrepreneurs, and ship owners would congregate, pooling information about shipping and other business of the age. Eventually, the coffee house patrons began sharing in the idea of group monetary indemnification of the risks and perils common among shipping goods throughout the British Empire around the known world. Thus the idea of pooling risk for cargo insurance gave way to the eventual Lloyd’s of London business model that has thrived ever since. There have been infamous “hiccups” for the market along the way like the loss of the Titanic, asbestos claims of the late twentieth century, the 9/11 attacks as well as the many fires, floods and hurricanes that are a part of life every year. Yet, Lloyd’s has endured because of its business dynamic and organization of spreading risk, and continues to evolve as a successful contemporary corporation. The market remains adaptable, not a rigid relic of the past. It employs corporate-minded leaders who have been able to restructure the business as needed over the years, making it more transparent and accommodating to the future of insurance. Staying ahead of the curve, Lloyd’s has become the champion of modern insurance. The innovative minds behind the market have heavily delved into the cyber and tech industries with insurance platforms for emerging risks like augmented, virtual and mixed-reality technologies. Furthermore, the market is truly a global phenomenon with insurance capabilities on every continent. Their newly-opened subsidiary company called Lloyd’s Brussels was founded to maintain and service European business in response to the UK leaving the European Union. Lloyd’s is a modern collective, focused on the future, but not faltering on its earlier self-nature where business relationships were more important than simply dollars, pounds, euros and yen.